Austria Election: Voters Expected To Elect New Government To Be Headed By Sebastian Kurz : Parallels No party won a majority in Austria's national election but Foreign Minister Sebastian Kurz, 31, is poised to head the government following upcoming coalition government negotiations. Sebastian Kurz, Austria's foreign minister and leader of the conservative Austrian People's Party (OeVP), arrives at his party headquarters on Oct. 13 in Vienna. The OeVP is currently leading in polls. Preliminary results show Austrian voters have given the right-leaning party of their 31-year-old foreign minister a mandate to form the next government, but not enough to run Austria without partnering with another party. Sebastian Kurz, who is likely to become the next Austrian chancellor, would be Europe's youngest leader. The popular foreign minister is said to be an avid hiker and windsurfer. 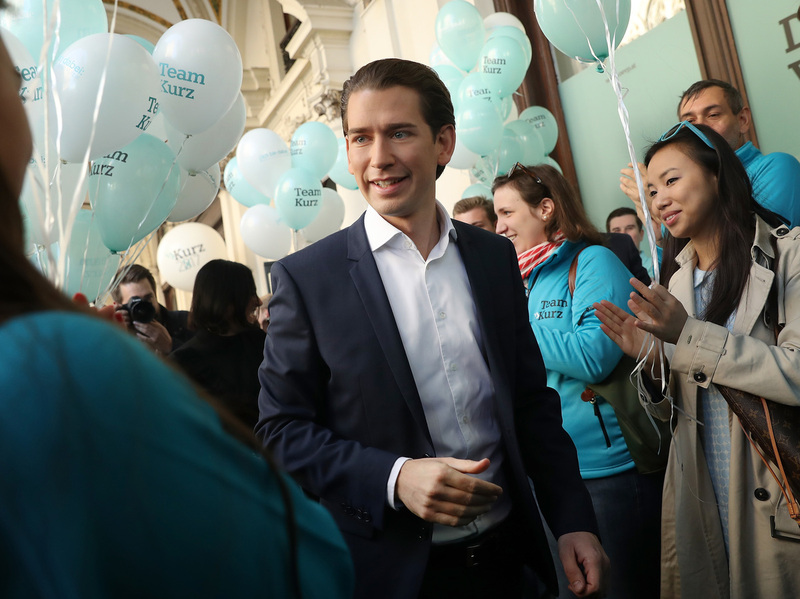 At a campaign appearance Oct. 13 in his hometown of Vienna, young people jostled to get close to Kurz, a scene Austrian journalist Gernot Bauer says is quite common. The irony is not lost on the right-wing nationalist Freedom Party of Austria, which preliminary results show had its best results in history and was the second highest vote getter. Nevertheless Kurz could ask the Freedom Party to join him in governing as his party appears to have failed to get a majority of the votes. "It is sad and distressing that such a platform should receive more than a quarter of the vote and become the country's second party," said WJC president Ronald S. Lauder. "It is still full of xenophobes and racists and is, mildly put, very ambiguous toward Austria's Nazi past. My only hope is that they won't end up in government." "He's like a pop star," said Bauer, who is national desk editor at the Austrian news magazine Profil. "He's like Justin Bieber, it takes hours (and) people want to make selfies with him. I think 20 percent of his campaign was just making photos and selfies. And this is also something that is a little bit criticized, because we don't know much about him." What is known is that Kurz's center-right Austrian People's Party had consistently led in opinion polls since he took over in May. He grew up in the working-class Vienna neighborhood of Meidling, where he still lives. His mother was a teacher and his father was a manager, said his friend and fellow party official, Gernot Bluemel. "He was raised with the idea that if you work hard, if you play by the rules, then you can achieve your goals you can realize your dream," said Bluemel, who heads the Vienna branch of the Austrian People's Party. "In a country where the level of taxes is being raised higher and higher, this dream is becoming more and more unrealistic." Kurz is determined "to make this dream possible again," Bluemel added. The foreign minister has worked hard to rebrand his political party as an agent for change, even though it's been part of the Austrian government for the past three decades. Its new moniker is the "New People's Party," and the faction's traditional black color has been replaced with a more trendy turquoise. What hasn't changed is Kurz's hard stance on refugees and immigration. In 2015, he vehemently opposed opening European Union borders to a million mostly Muslim asylum seekers and migrants, who streamed into Austria and points north and west. Such uncontrolled immigration causes security problems for Austria, he said during the recent Vienna campaign stop. Kurz also supports curbing benefits for new arrivals, and making them learn German and adapt to local customs. "He introduced 'integration by effort,' so that everybody is welcome here in Austria who is willing to make a contribution, to work for himself, to pay taxes, to play by the rules," Bluemel said. "And that was a way that was not so common in Austria then, but he made it popular." During the recent campaign stop, Kurz told the crowd: "Please give us your vote so we have the power to make real change." Bauer said change has been the mantra of this election, even though the Austrian economy is booming, jobs are up and unemployment is down. The election is being held a year earlier than originally scheduled after the current governing coalition fell apart. "Maybe like everywhere in Europe, there's a feeling of insecurity over globalization," Bauer explained. Austrian parents used to say their children were better off than they were, "and now all the polls say that for the first time, parents are afraid their children might not be as well off as they are. "Austria is a rich country. We don't have so many big problems, but still there is a desire for change — and Sebastian Kurz, he symbolizes this desire for change because he's fresh, though he is the longest serving minister in the actual government right now." The last time the two parties formed a government in Austria in 2000, objections to the Freedom Party — which originally was headed by a former Nazi — spurred widespread international criticism and EU sanctions. But such a backlash is not likely this time, as the party has toned down its approach and more EU member state governments are shifting to the right. Bluemel added Kurz and their party will keep any coalition partner in check. "The crucial point is we are pro-European," Bluemel said. "So we would never accept an anti-European course in the government coalition. We would never accept an anti-Semitic course in government. Never, ever, ever." Still, many European leaders are nervously watching Sunday's election, especially because Austria is scheduled to take over the EU presidency next year.